Despite an uncertain economy, the market for green building is exploding. The US green building market has expanded dramatically since 2008 and is projected to double in size by 2015 (from $42 billion in construction starts to $135 billion). But green-building pioneer Sim Van der Ryn says, “greening” our buildings is not enough. He advocates for “empathic design”, in which a designer not only works in concert with nature, but with an understanding of and empathy for the end user and for ones self. It is not just one of these connections, but all three that are necessary to design for a future that is more humane, equitable, and resilient. Sim’s lifelong focus has been in shifting the paradigm in architecture and design. Instead of thinking about design primarily in relation to the infrastructure we live in and with—everything from buildings to wireless routing—he advocates for a focus on the people who use and are affected by this infrastructure. Basic design must include a real understanding of human ecology or end-user preferences. Understanding ones motivations and spirituality, Sim believes, is critical to designing with empathy for natural and human communities. In Design for an Empathic World Van der Ryn shares his thoughts and experience about the design of our world today. With a focus on the strengths and weaknesses in our approach to the design of our communities, regions, and buildings he looks at promising trends and projects that demonstrate how we can help create a better world for others and ourselves. Architects, urban designers, and students of architecture will all enjoy this beautifully illustrated book drawing on a rich and revered career of a noted leader in their field. The journey described in Design for an Empathic World will help to inspire change and foster the collaboration and thoughtfulness necessary to achieve a more empathic future. Sim Van der Ryn is President of The Ecological Design Collaborative, a design and consulting practice providing comprehensive services though the non-profit Ecological Design Institute established in 1969. He has been at the forefront of integrating ecological principles into the built environment, creating multi-scale solutions driven by nature’s intelligence for over 40 years. Sim has served as California’s first energy-conscious State Architect, authored seven influential books, including Ecological Design, and won numerous honors and awards for his leadership and innovation in architecture and planning including a Fellowship of the Graham Foundation for Advanced Studies in the Fine Arts (1997); Rockefeller Scholar in Residence, Bellagio, Italy (1997 and 2013); a Commendation for Excellence in Technology, California Council American Institute of Architects (1981); and a Guggenheim Fellowship (1971). He is an adjunct architecture faculty member at the University of California, Berkeley. "The author effectively, often poetically, conveys his message...Inspiring, and beautifully expressed..."
"...tells his personal story while also arguing for collaborating with people and nature..."
"In its pages, Mr. Van der Ryn turns inward to the thoughts and feelings underlying his work as it has evolved over a lifetime." "Not everybody willing to change their inner self will have the same path as Sim Van der Ryn, but by sharing his story he's given them something enjoyable to read (and look at, with his watercolors that are sprinkled throughout the book) while they search for their own paths." "...[suggests] ways to create a better world that focuses on the people who use and are affected by the infrastructure, as well as the need to reconnect design to human and natural elements." "What I noticed at the heart of this book—that I have yet to read in other architecture books—is an exploration into identifying personal intention behind design endeavors." "In Design for an Empathic World, Sim Van Der Ryn weaves the architecture of empathy for self, others and nature into a vibrant, compassionate whole. Brimming with gratitude, Van Der Ryn tells stories from his life as an architect, teacher and thought leader. His lesson, that only with empathy can we repair the fabric of humans and nature." 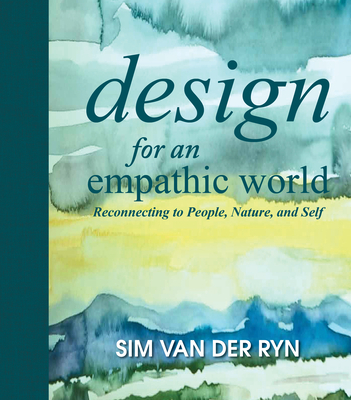 "In Design for an Empathic World, Sim Van Der Ryn lays out timeless principles of how to become a true denizen of a living planet. His humane and insightful grasp of nature and society, expressed in this lyric and beautifully illustrated work, reveal Sim to be a treasured and iconic master of the craft of design and architecture." — Paul Hawken, author of "Blessed Unrest"
"Designers of my generation leave academia searching for ways to make their practice meaningful beyond themselves. Design for an Empathic World is a field guide for a new creative journey, written and illustrated by a wise 'sherpa' who I have long looked to for answers. It makes the case for architecture as an act of love, a peaceful defiance, and a constant response to economy, environment, and society." "With great wisdom and lucidity, Sim Van der Ryn illuminates our world, bestowing his insights into design and gracing us with his extraordinary art. A tour de force that leaves the reader with a deeper sense of the possibilities for beauty in our lives and sustainable living on our planet." "In this evocative and rich journey, the lessons that Sim shares with us are significant, inspiring, and create fertile ground for a beautiful reframing of the future. Design for an Empathic World is like a love letter to architects, artists, dreamers and all who enjoy making and inhabiting place."